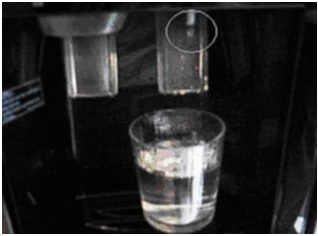 It is normal for the water dispenser to leak a few drops (less than 1cc) of water after being used. You may also notice water dripping after dispensing crushed ice. This is also normal because tiny pieces of shaved ice stick in or around the ice chute. As the ice melts it drips down in the dispenser area. Newly installed units can take up to 24 hours to cool down completely. Especially during this time, the plastic water tank contracts and expands as the temperature changes. In addition, when room temperature water enters the cold water tank it can expand and contract. This can also cause a drip from the dispenser. Note: During summer months, water pipes can get hot and warm the water in the cold supply pipes. When this happens, the water can be at above room temperature. If the dispenser has a steady drip, it may be caused by air in the water line or an improper water line connector installation after door removal. 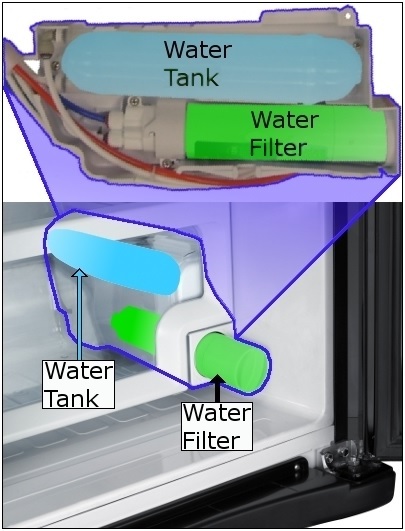 If the water filter was recently replaced, dripping from the dispenser may occur because air is trapped in the water filter. 1 Let the refrigerator cool for a full 24 hours after installation. 2 Then, dispense 2-3 gallons of water. 3 If the drip stops, there was air in the water line which is normal upon installation. However, if the drip continues, remove the water filter and dispense one more gallon of water. 4 Re-install the water filter. If the dripping stops, there was air trapped in the filter housing. If the dripping continues, the unit may require service. You may call Samsung Customer Care to inquire about the warranty and service booking procedures for your unit. Ice maker is producing too much ice, why is this?